Many years ago my first professional job was in the Hotel Aarauerhof in Aarau, northern Switzerland in the eighties. I was employed as a stagiare, somewhere between a commis and an apprentice. It was a great introduction to the world of international hotels. I shall have to dig out some of my old photos from the time for a future post. The article here derives from the same Woman’s Own volume from the mid-fifties as the others in this series. 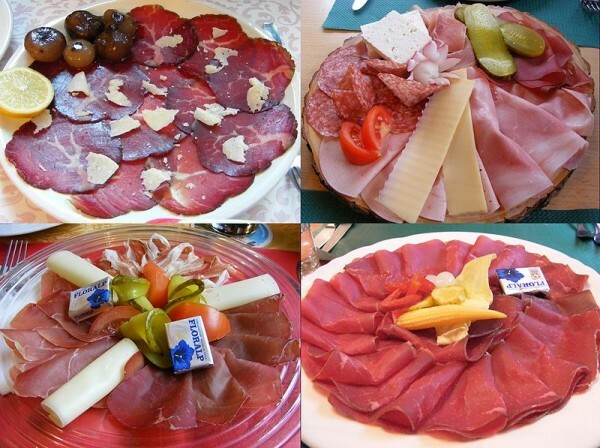 Swiss cuisine is created from many regional and national influences, including French, German and Italian. 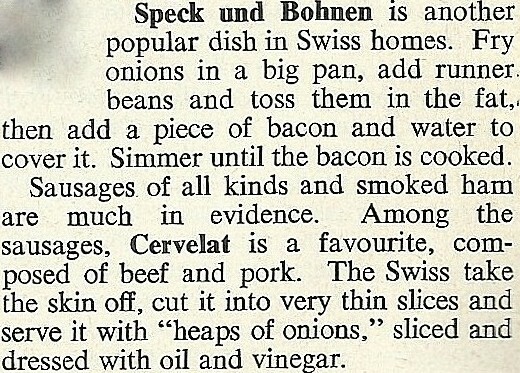 It also features many dishes specific to Switzerland. 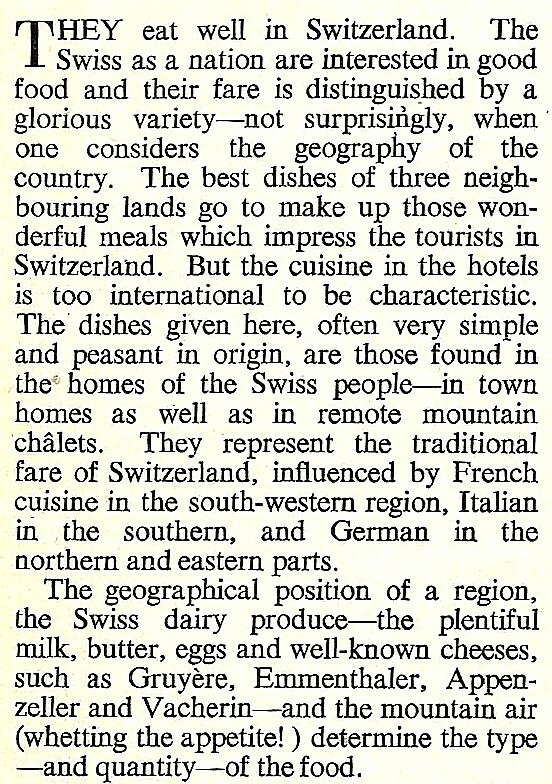 Being, historically, a country of farmers so traditional Swiss dishes tend to be plain and consist of simple ingredients. 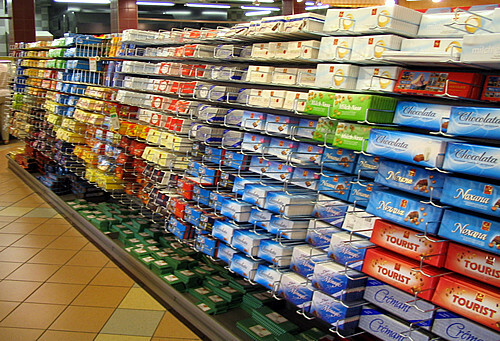 The foods most often associated with Switzerland include cheese, potatoes and chocolate. Swiss cheeses, in particular Emmental, Gruyère, Vacherin, and Appenzeller, are famous Swiss exports. 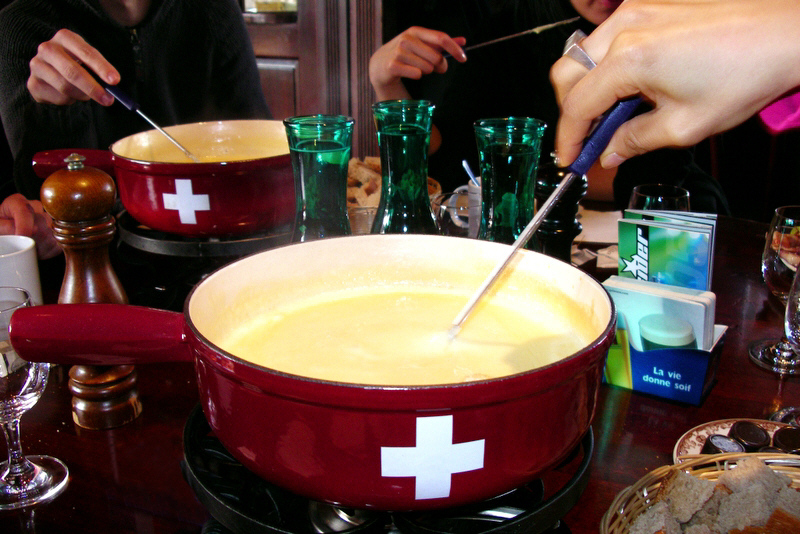 The most popular cheese dishes are fondue (right) and Raclette. 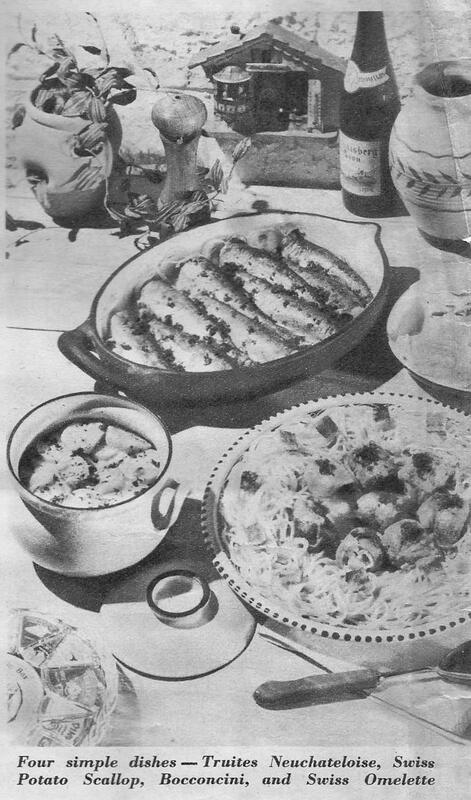 Both these dishes were originally regional specialities but were popularized by the Swiss Cheese Union to boost sales of cheese. Bread and cheese is a popular dish for dinner while tarts and quiches are also fairly traditional. Tarts in particular are made with all sorts of toppings, from sweet apple to onion while cervelat or cervelas is considered the national sausage, and is popular all over Switzerland. Kalberwurst is s sausage with a distinctive, creamy flavor that originated in the Canton of Glarus. Made with veal, milk, ground crackers, and mild spices it has a smooth texture and mild taste. It is often cooked with onions and gravy. Landjäger is a semi-dried sausage traditionally made in Switzerland, (but also in Southern Germany, Austria, and Alsace) and is popular as a snack food during activities such as hiking. It also has a history as soldier’s food because it keeps without refrigeration and comes in single-meal portions and tastes similar to salami. Birchermüesli was invented by Dr Maximilian Oskar Bircher-Benner (1867-1939), a pioneer of organic medicine and wholefoods. Riz Casimir is a preparation of rice with curry sauce and minced pork blended with tropical fruits: pineapple, banana and cherries, sometimes with currant grape. 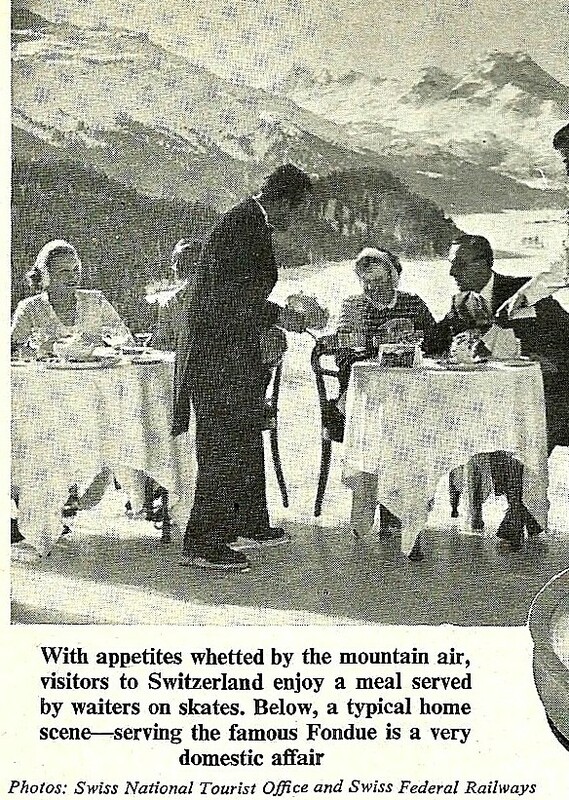 It was first served in 1952 by the international chain of hotel and resorts Mövenpick. Rösti is a simple potato dish regarded as a Swiss German favorite. 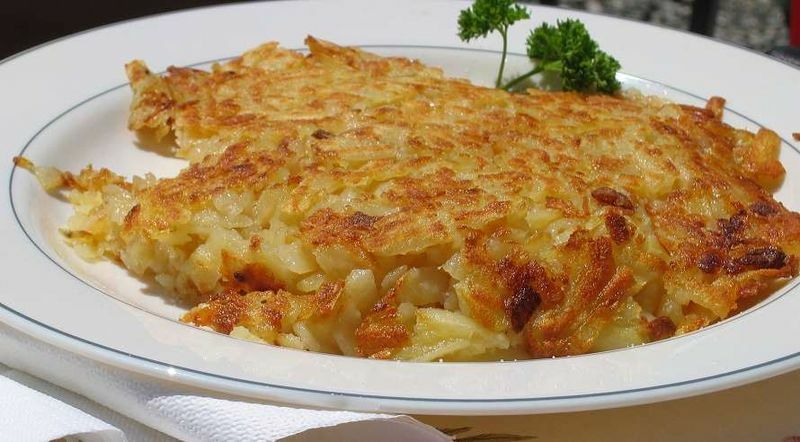 A crispy flat dish made using grated potato and regional flavourings it has given its name to the Rösti ditch, the imaginary line of cultural demarcation between the German and French regions of Switzerland. Tirggel are traditional Christmas biscuits from Zurich. Made from flour and honey, they are thin, hard, and sweet. 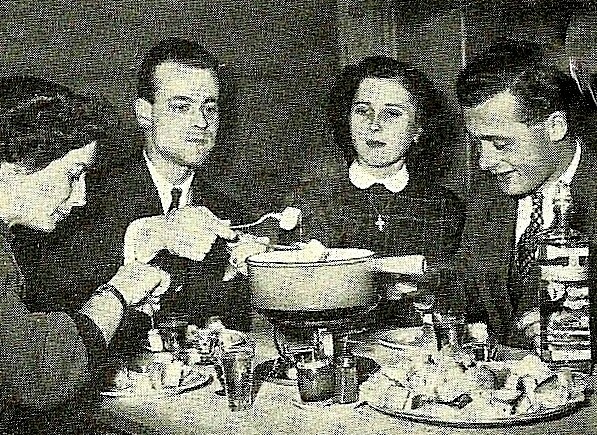 Bündner Nusstorte comes in many different forms throughout Switzerland but the most famous is probably the one from the Engadine, a valley in Canton Graubünden while Graubünden Barley Soup is a well regarded soup from the same region. This entry was posted in European Cuisine and tagged barley soup, buendner, canton, Europe, graubunden, salami, sausage, Womans Own. Bookmark the permalink.